After 2 months of the plastic chrome surround being fitted the chrome started to peel very badly,Reported this to Sales who uprated the replacement to the stainless version,The transaction was very well done with the replacement shipped overnight. I bought the stainless steel version. it fitted in seconds using the number plate fixing screws. Still looks good after nearly 6 months. Along with th.. I bought this item in August 2013 and it's lasted less than 6 months. (Started flaking off and looked tarnished with weather wear) I have just replac..
Further to my earlier review on this product, I feel compelled to revisit having had the item on the car for a while. The chrome finish has worn very .. 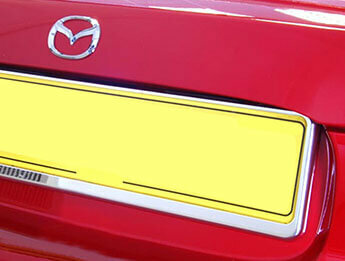 Very pleased with the Number Plate Chrome Surround - looks fab on my Mk 3 MX5 very easy to fit and would reccomend it. Great price, great delivery - T..
As previous reviewer commented, it didnt line up very well with the screws on my Mk2.5, so I had to file them out slightly. It also attaches near the..
Looks ok when on. Not the highest quality chrome fitting I have seen and in my case it required drilling as non of the holes lined up with the pre dri..